Is Shake Shack a Buy? 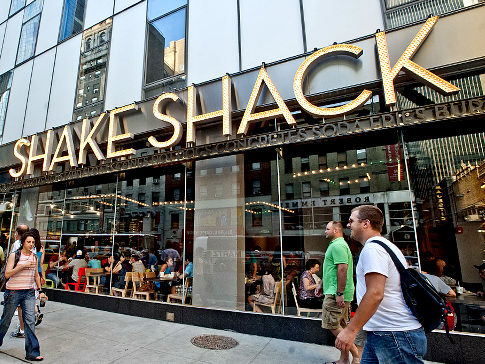 I must admit, even I was blown away by how high Shake Shack (NYSE: SHAK) catapulted on its debut back in January. Prior to the IPO, I actually shared my enthusiasm over SHAK, but warned investors to hold off on picking up shares until Q4 numbers came in. The company's got a good thing going, but it's also embarking on a very aggressive growth strategy that will likely limit its ability to deliver stellar results in the near-term. Yesterday afternoon, we got a look at those Q4 numbers. Total revenue and same-store sales numbers impressed, but a net loss of $1.4 million spooked analysts, which were expecting a less corrosive loss. The low end of projected revenue also fell short of Wall Street estimates. Overall, I actually like the company, and think the net loss wasn't quite as bad as some are making it out to be, considering much of that came from expenses related to the IPO. And it looks like SHAK is actually starting to shake off the stench of weak hands that ran for the hills this morning. Still, I remain very cautious as we head further into 2015. I'm not confident that the broader market is going to survive this year without a few violent sick days that'll vomit up overzealous bulls like a dog with a bad case of worms. And with SHAK trading over $48 right now, I do think it's a bit top-heavy. For now, I'll remain on the sidelines. But if we do see a purge in the broader market, and SHAK loses some of its mojo, it could be a great buying opportunity.